Facing the Low Seasons - When You’re Running On Empty - We live in a tourist area and everyone living here is affect by the highs and lows of tourist season. Our people need your prayers at this time of year as many are under a great deal of stress. As many feel like they are running on empty we know that God can feel that emptiness. Please pray that our people will follow the teaching of Christ. Pray that many will come out to our weekend services. We are having a great time studying God's Word and sharing life together with friends in our small groups. Pray for Daniel and Anna as they lead this small group each Wed. night. 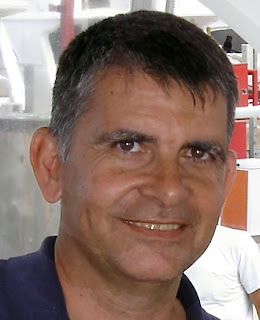 Pepe is a good friend, he is running for Presidente of Playa Del Carmen. Pepe and his wife Amy are in need of your prayers. They both love the Lord and are very active church members. Last week hurricane Dean severely damaged their home here in Paamul. Pepe has a good chance of winning the election. We have been praying for servant leadership for our city for some time now we ask you to pray for Pepe that God will protected him and give him wisdom as he goes through this campaign season. These two pastor from our church lead a team down to the hardest hit area 3 hours south of Playa today. Our church donated food clothing, generators and money to help those most effect by hurricane Dean. Pastor Jose reports tonight that the people in the Costa Maya were very thankful for the help. Jose said,"Many donations are now getting to the people and it looks like most of the basic needs are being met." The people have already started the long rebuilding process. Please continue to pray for these victims of hurricane Dean. At our staff meeting today I lined out plans to launch big among the poor. PRAYER, is the key. Getting people to see it and pray believing it will become reality is the hardest part of launching big in Mexico. We are praising God today as we break ground on our mission house in Paamul. Our worship services this morning Paamul were full of joy and thanksgiving because God heard and answered our prayers. NO LOSS OF LIFE IN MEXICO. This is a miracle, a category 5 hurricane and no loss of life. On top of that our church building and our grass roof house were not touched... GOD IS GOOD! I preached today in both services in Paamul we had about 60 people in our Spanish service. They said they loved it and they understood every word of my weak Spanish, next week I'm going to preach on lying. Pray for our team and for the weekend services. Still no Internet in the house. I don’t know how Paul did it without email. We had a great time in the States. I had the opportunity to talk with many church leaders, it was interesting to see how the churches are changing in the way they do international missions. We are seeing a move to more and more hands on missions. We are excited about the change but it is more important than ever to use the short-term volunteer teams in ways that really impacts lostness. We have been asking the question for some time what’s the best use of short-term volunteers. I don’t know if there is an answer to that question because each team and each church is so different. We believe that PRAYER is the key to seeing a movement of God in this area. Most people will not pray until they see it, so we need volunteers to come and catch the wave. We just saw God move a storm and we know He can changes lives. WILL YOU PRAY FOR A MOVEMENT OF GOD IN PLAYA? HURRICANE REPORT FROM Homer Hawthorne Missionary working in harder hit areas to the South of us. · In both states all people have left shelters to return to their homes or family. · 95% of the streets have been cleared for traffic. · Water service to houses in Chetumal was restored today. · 60% of the electricity has been restored to the city. Crews from all over Mexico are working in 24 hour shifts to restore power to the city. The power of the pastor’s house we are staying was restored yesterday morning. The government is promising to have all the power restored in a couple of more days in the city. · There is cell phone service all over the city but some sectors still don’t have line service. · Two gasoline stations are pumping gas in Chetumal with long lines. However 15 miles away we filled up at a station where there was no waiting line. The station in Bacalar was working off a generator. · Several of the major banks have ATM machines already functioning. · Supermarkets are open but some still don’t have electricity and are restocking. Even some restaurants are open. · Today the Salvation Army, the Red Cross and the Mexican Army were distributing food packets in Chetumal. 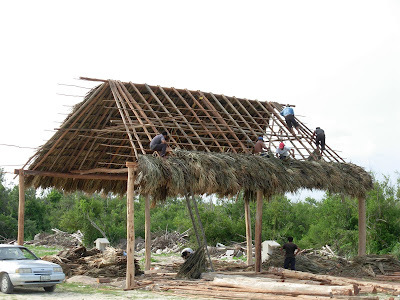 · We have also seen today Mexican Army distributing roofing sheets in Chetumal and Bacalar which are the two largest populated areas of the far south of the state of Quintana Roo. · The Quintana Roo state government is trying to be transparent about what they still have in storage and published today what they yet have to distribute in the next few days. This is because of past mistakes and fraud in pervious relief efforts. They will distribute in the next few days in the affected area of the state of Quintana Roo: 14,740 food packets, 294,800 tar roofing sheet, 20,000 blankets, 21,900 light mattresses and 300 bottles of purified water. · In the State of Campeche, which was not, as hard hit the government to date is distributing 24,000 food packets, 24,000 light mattresses, 6,000 packets of soap and cleansers. We are working to get the church building and the house back to normal it’s like moving. We were also able to help some of the families who have lost their homes down south of us buy roofing material. Thanks so for your giving and your prayers. A house to return to..
We arrived home and we are praising God for the friends, co-workers and the volunteer team from CrossPointe Church in Bothell, WA. and the thousands of folks that were praying for us. Cris and Dona and the volunteer team did a great job of boarding up our house. There are great needs here in the area and I am thanking God for those who gave this week to make it possible for us to stay at the task. The flight from Houston was great we landed 5 minutes early and we got to go to front of the immigration line because we had FM2s, Mexico visas, our bags were the first ones off and we were out of the airport in record time. I thought to myself, you know living in Mexico is getting much easier all the time. And then Cris and Donna picked us up at the airport in our car and the car would not start…. We worked on it for a while, we think it has a short in the wiring. Anyway to make a long story short it finally started and we returned to Paamul and we could not get in the house for the all the stuff but we were really thankful we have stuff to move. It's going to be awhile getting back to normal if there is a a normal on the mission field. We do have electricity, no Internet in the house yet but we are working on it. Darla and I are flying out of Houston this morning. The first reports that we have are that our stuff and the church building had very little or no damage. This is truly a miracle. Some of our church members however were not as fortunate. Many of you know Pepe and Amy the owners of Paamul. We understand after talking to Amy that thier house in Paamul suffered extensive damage. I have not heard from all our church members so please continue pray. I may not have internet for a few days but as soon as we are up I will try to post some photos. Thanks for praying, from our team in Playa. We just wanted to thank you for your prayers in our behalf. As you can tell my the news, the Lord honored your prayers and Hurricane Dean hit farther south near Belize instead of along the coast near Cancun, Playa del Carmen, etc. We were prepared with provisions and had our apartment boarded up and ready, but the Lord is faithful and all we experienced were some high winds, rain and no electricity for about 7 1/2 hrs. (mostly night hours) The winds have died down a lot and it's partly sunny at this time. Can you believe it? I'm in awe of the way the Lord works. It's a huge blessing to know that there are so many Christian that held us and this area up in prayer in the last few days. We love and appreciate you so much. Maybe we'll be able to do the same for you at a time when you need it, too. We would be privileged to do so. Just let us know! Many of our church members living in the Colosio did not have the money to prepare for this kind of storm so with your help we can provide needed food and water for these . Please continue to pray for the our people in the path of this storm. Pastor Terry and Debbie Hill are leaving today for Alaska. Terry and Debbie were a great help to us, preaching and getting things ready for the storms. Cris and Dona are still working to get the volunteer team out. We need your prayers. The first flight they can get will be at 5:00pm on Monday pray that the airport will remain open. We are thanking God for the great work this volunteer team has done helping get ready for the storm . Darla and I are still in North Carolina, Today I spoke in Spring Garden Church, in New Bern, NC. Please pray that these volunteers can get out of the path of Dean by Monday. Pray also for our team in Playa, Dr. Dainel, Jose, Carlos, Cris, and Dona. Pray for Darla and I as to share the vision and lead people to pray for the work in Playa. We will be at Spring Garden Baptist Church in New Bern NC tomorrow. Cris and Donna work with our short-term volunteer teams in Playa Del Carmen. We have a short-term volunteer team in Paamul this week. They changed their flight cutting their trip short. They plan to leave on Monday this is the earliest flight they could get. Pray that they will be able to make this flight. Cris and Donna have will be riding out the storm in Playa Del Carmen. Darla and I plan to be back on Wed. We are planning to fly to Houston on Tuesday to meet with church leader thier. The storm is gaining strength it is now at 145 mp winds. WE KNOW THAT GOD LOVES US! Please pray for us as the house is going up and hurricane Dean is bearing down on Paamul. This roof cost us $6,500 and we can not get hurricane insurance in this part of Mexico. 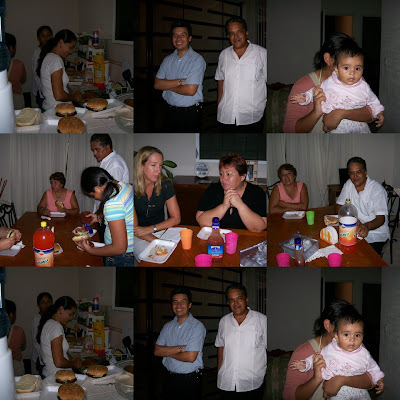 Pray also for Cris and Dona as they are leading a volunteer team this week. I am praying that the team will change their tickets and leave as soon as possible. Don Water one of our former church members from Cancun was driving home from work in Chincha Peru near Peru's southern coast when the two-minute, 8.0-magnitude quake struck Wednesday evening. Don is OK but the building where he was staying was leveled. Don's wife April is visiting wit h us today in Greenville, NC. Pray for April and Don this is a photo of April. Pray also for all the family effected by this earthquake. We also need your prayers for our mission team in Playa. 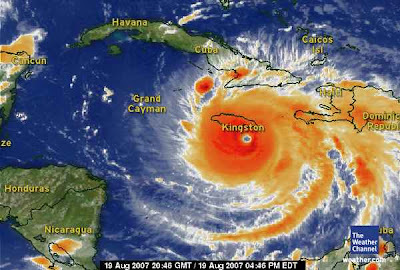 Dean is forecast to be a category 4 or 5 when it makes landfall near Playa. Pray that we can get the volunteer team out of the country by Monday. Pray that this storm will weaken and or change courses. Pray also for one our new local church Planters Carlos as we try to get the new service going in Nueva Creacion, in Playa. Pray as a Storm is moving our way. We have a storm "dean" that looks like it could be heading to the Playa Del Carmen area of Mexico. We are praying that the storm will not gain strength as they are forecasting. Pray for the volunteer team that is staying in Paamul. 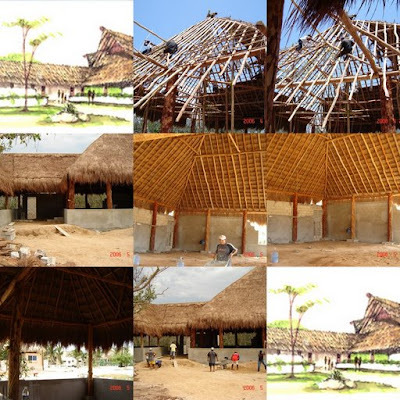 Pray that our grass roof house that is under construction will not be blown away. I shared our vision for the work in Playa with our home church in New Bern North Carolina tonight. Darla and I are staying at my parent's home in Greenville. One of our former church members from the Cancun church is staying with us tonight, April Waters. Her husband Don is working in Peru. We just saw on TV that a magnitude 7.9 earthquake struck off the coast of central Peru on Wednesday evening, killing 15 people and leaving 70 hurt. April has not yet been able to make contact with Don. Please pray for Don and April tonight. If 50 is over the hill that must mean I'm on top to the hill today as I celebrate my 50th birthday. I played a round of Golf and I shot a 39 on the front 9 the best nine holes of my life. We will not talk about the back 9 but I finished with an 86. I wish I could stay on top of the hill. We need your prayers as I'm meeting with two churches tomorrow. Pray that we will build our prayer support team and that God will put it on the hearts of these church leaders to PRAY, GO, and GIVE. Also pray for our mission team in Playa Del Carmen. Millar's house in Paamul going up. We are excited to see that our missionary house in Paamul is beginning. Our new home will have a grass roof and block walls. It will be small but it will work great for Darla and I. It's only a couple hundred yards from the best beaches in the world and about a 1 minute walk to our church in Paamul. Darla and I are in Greenville, NC tonight staying at my folks place. It's hot up here this week but we have had a lot of training with heat. We had a great day Sunday and had great reports from our team in Mexico as well. We are now in North Carolina after a long day of travel. After living outside of the U.S. for 12 years I am going through a little reverse culture shock. It is not like we have been that cut off from U.S. culture but there are things that are very different up here. No one walks anywhere, the traffic lights do not blink before turning red, the Mexican food here is not spicy and the stores have so much stuff. Today at the airport in Little Rock a group of soldiers got off the plane just returning from Iraq and everyone in the airport stood and began applauding the troops. One lady behind me began to cry and she did not know these men. I forgot how patriotic Americans can be, that is still true at least in Arkansas. The soldiers returning home reminded me one day we are going to arrive to our home in heaven and if we are obedient to His call to service we will be greeted with a Great heavenly applause.. Please if you Read this today please Pray for our Sunday services in Paamul and Playa Del Carmen. Darla and I had fun today celebrating with our daughter Brittany as she turns 20. We no longer have teenagers that's hard to believe.... Brittany is continuing her studies in Arkadelphia. She will be a junior this fall. Pastor Terry and Debbie from Rabbit Creek Community Church arrived safely in Paamul. Terry will be preaching in English on Sunday morning in Paamul and preaching through a translator out at our Colosio campus Sunday night. Doug and Darla arrive in Ark. After a long day of travel we arrived in Hot Arkadelphia, Ark. The next few days we are going to be visiting with our daughter Brittany. 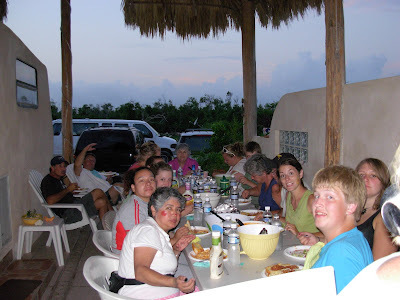 Every Tuesday morning the staff of the Community Fellowship of the Riviera Maya meets in VIPS for breakfast. We always start the meeting by checking the scoreboard. Where are we winning? At the Fellowship we score when we see people contacting with and growing in Christ, when people are building Christain friendships and when church members are using their resources for the glory of God. This week Pastor Jose said he had a few people pray to recieve Christ on the Colosio Campus and they are starting another new small group out there . Carlos said the start of you new work in Nueva Creacion was a win. Cris said that his home group is growing and we are all praising God for these wins. We had 77 people come out for the Hot Dog Lunch last Sunday. I lead the service in Spanish this past week at the Paamul Campus, and the people seemed to understand, that was a big win. 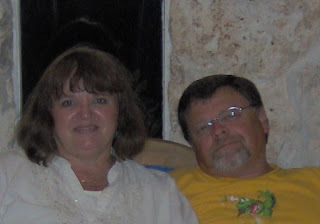 Terry and Debbie Hill from Alaska are coming down to help us out while Darla and I are in the States and that is a win. PRAISE THE LORD! They started work on our mission house. This is our new home in Paamul. Following that great Mexican tradition the workers are going to start building our one bedroom grass roof house, manana. We hope to be in our new home by the first of the year but in that great gingo tradition we want it yesterday. We had a great day today in the Paamul services. We now have 5 weekend services. Two in Paamul and two in the Colosio and now a new Sat. night service in Nueva Creacion in northern Playa.